Down by the deep and muddy Mississippi, something’s not right. 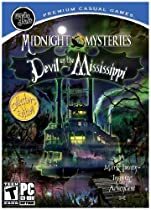 A ghostly riverboat brings to light a new conspiracy for players to unravel in this all-new Midnight Mystery. Mark Twain’s ghost has come to you seeking help. When Twain’s passion for literary history reignites a controversial debate about the true identity of Shakespeare, the age-old question resurrects one of the most evil interested parties. After waking the evil spirit, Twain sets about to rid his time of the darkness, but the plot only thickens. With Twain’s help, you have to unravel the connections to try to set history straight while dangerous forces loom. Was Shakespeare a fraud? And just how did Twain get caught up in a strange Elizabethan rivalry all those years later? Find out in this Midnight Mystery!